to ensure there’s enough food & drink. This a unique opportunity to share knowledge with those on the cutting edge of pesticide research, meet with effective advocates to talk organizing and policy strategy on protecting people and the environment, and learn from practitioners on implementation of plans for organic management practices without toxic pesticides. 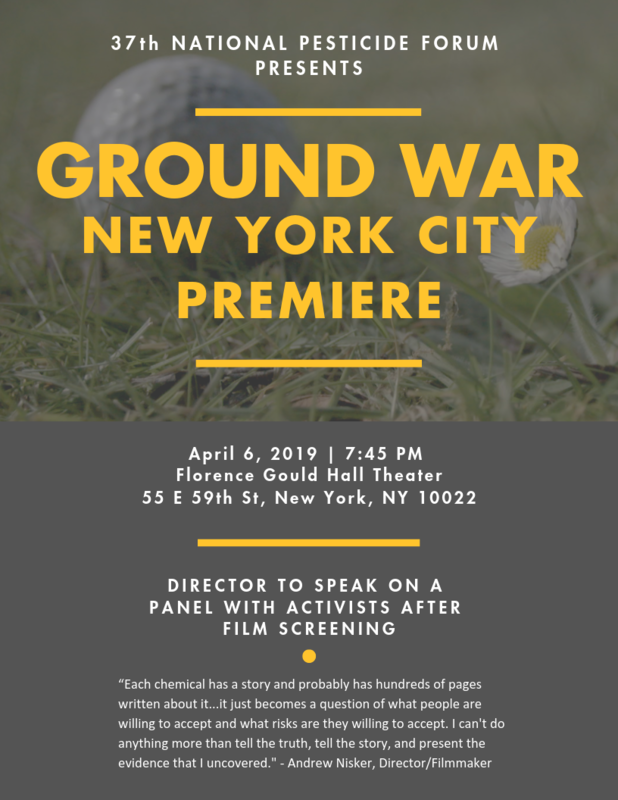 Join us for the New York Premiere of Ground War, a documentary. Joan Dye Gussow, EdD, called the “Matriarch of the Local Food Movement;” nutritionist, educator, writer, gardener; adjunct professor, professor emeritus, former chair, Nutrition Education Program, Teachers College, Columbia University; author of seven books, including This Organic Life: Confessions of a Suburban Homesteader, and Growing, Older; formerly: Food and Nutrition Board, National Academy of Sciences; FDA’s Food Advisory Committee; National Organic Standards Board; Piermont, NY. Peter Del Tredici, PhD, is an American botanist and author. He is a former senior research scientist at Arnold Arboretum for 35 years and a lecturer at the Harvard Graduate School of Design. Dr. Del Tredici is the author of the widely acclaimed Wild Urban Plants of the Northeast: A Field Guide (Cornell University Press, 2010). Jeff Pettis, PhD, former research leader, USDA’s Bee Research Laboratory, groundbreaking researcher on the behavior and chemical ecology of honey bees; principal, Pettis and Associates, LLC; president, Scientific Commission on Bee Health, Apimondia (International Association of Beekeeper Associations); Salisbury, MD. Virginia Rauh, ScD, deputy director, Center for Children’s Environmental Health, Columbia University; professor, Population and Family Health, Columbia University Medical Center; research on effects of toxic chemicals and conditions on developmental outcomes; New York City, NY. Maida Galvez, MD, associate professor, Department of Environmental Medicine and Public Health and Department of Pediatrics, Icahn School of Medicine at Mount Sinai; Director, Region 2 Pediatric Environmental Health Specialty Unit (PEHSU); Founding Director, New York State Children’s Environmental Health Center (NYSCEHC); New York, NY. Routt Reigart, MD, professor emeritus, former director, Division of General Pediatrics, Medical University of South Carolina; co-author, Children’s low-level pesticide exposure and associations with autism and ADHD: A review; co-author, Recognition and Management of Pesticide Poisoning, U.S. Environmental Protection Agency (EPA); former chair, Children’s Health Protection Advisory Committee, EPA; Charleston, SC. 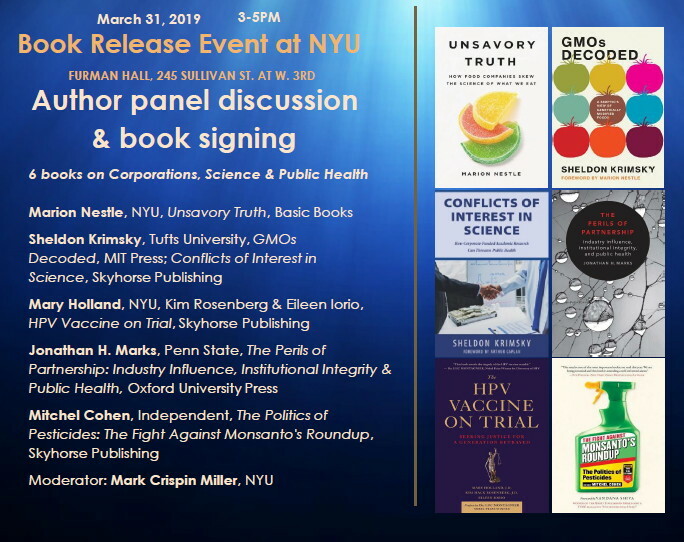 Sarah F Evans, PhD, assistant professor, Environmental Medicine and Public Health, Children’s Environmental Health Center, Institute for Exposomic Research, Icahn School of Medicine at Mount Sinai, New York, NY. Rella Abernathy, PhD, integrated pest management coordinator, City of Boulder, CO.
Caroline Cox, research director, Center for Environmental Health, Oakland, CA. Paula Dinerstein, Esq, senior counsel, Public Employees for Environmental Responsibility (PEER); Washington, DC. Jay Feldman, executive director, Beyond Pesticides; former member, National Organic Standards Board; Washington, DC. Eric T. Fleisher, a national leader in the field of sustainable horticulture and soil science. Melinda Hemmelgarn, RD, registered dietitian, investigative nutritionist, advocate; host, nationally syndicated Food Sleuth Radio, Columbia, MO. Joel Kupferman, Esq, executive director and senior attorney, New York Law and Environmental Justice Project, New York City, NY. Chip Osborne, president, Osborne Organics, Inc.; chair, Recreation and Parks Commission; Marblehead, MA. Warren Porter, PhD, professor, Zoology and Environmental Toxicology, University of Wisconsin Madison; Madison, WI. Urvashi Rangan, PhD, chief science advisor, GRACE Communications Foundation; principal, Rangan Consulting LLC, New York City NY. Kim Richman, Esq, founding partner, Richman Law Group, Brooklyn, NY. Ling Tan, founding member, Safe Grow Montgomery; pesticide issue chair, Sierra Club Maryland Chapter; Montgomery County, MD. Peggy Shepard, executive director, WE ACT for environmental justice, New York, NY. Patti Wood, founder and executive director, Grassroots Environmental Education; author, The ChildSafe School; Port Washington, NY. Environmental Law Advocates at Fordham University School of Law, No Spray Coalition, Grassroots Environmental Education, New York Environmental Law and Justice Project, Friends of Animals, New Yorkers for Pesticide-Free Parks (NYPFP), The Sierra Club NYC Group, Sixth Street Community Center, Food and Water Watch in New York, NYC Grassroots Alliance, Garden of Eve Organic Farm & Market, iEatGreen, Perfect Earth Project, Battery Park City Authority, WE ACT for Environmental Justice, Center for Earth Ethics, Brooklyn Grange Rooftop Farms, Northeast Organic Farming Association of New York (NOFA-NY), Clean Water Action NJ, Green City Force, Newtown Creek Alliance, 350 NYC, Green Inside and Out, and more. Miss out on previous Beyond Pesticide Forums? 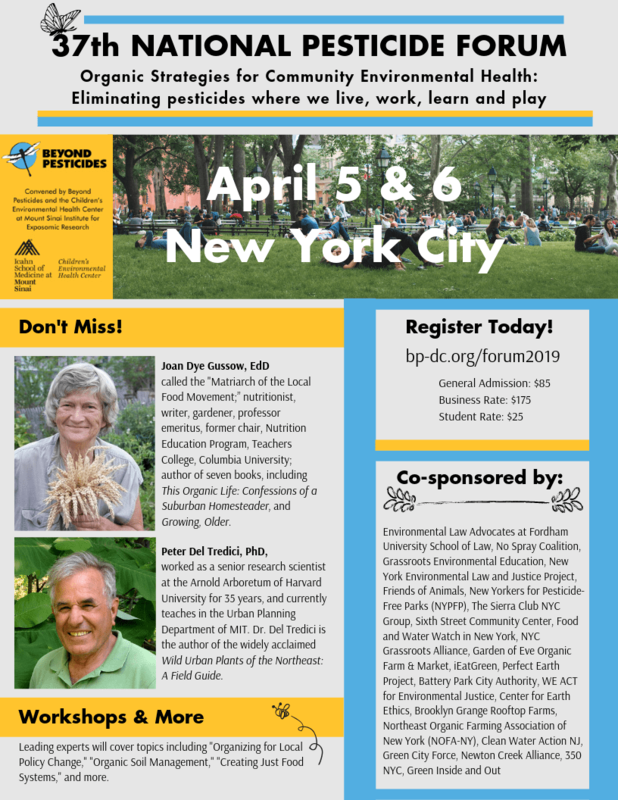 See Beyond Pesticides’ YouTube page to view speakers, panels, and workshop discussions on a range of critical topics relevant to adverse health and environmental effects of pesticides and strategies for change. Check out our past conferences here. the politics underlying the mass use of pesticides and the challenges people around the world are making against Monsanto’s most dangerous creation, glyphosate. The scientists and activists contributing to The Politics of Pesticides, edited by long-time Green activist Mitchel Cohen, explore not only the dangers of glyphosate — better known as “Roundup” — but the campaign which ended with glyphosate declared as a cancer-causing agent. In an age where banned pesticides are simply replaced with newer and more deadly ones, and where corporations such as Monsanto, Bayer, Dow and DuPont scuttle attempts to regulate the products they manufacture, what is the effective, practical, and philosophical framework for banning glyphosate and other pesticides? The Fight Against Monsanto’s Roundup: The Politics of Pesticides explores the best strategies for winning the struggle for healthy foods and a clean environment. It takes lessons from activists who have come before, and offers a new, holistic and radical approach that is essential for defending life on this planet and creating for our kids, and for ourselves, a future worth living in. Order your copy here. Bulk discounts for anti-pesticides and anti-GMO organizations are available. Write to mitchelcohen@mindspring.com to make arrangements. Mitchel Cohen coordinates the No Spray Coalition in New York City, which successfully sued the City government over its indiscriminate spraying of toxic pesticides. In 1997, he organized the campaign to rid NYC public schools of milk from cows injected with genetically engineered Bovine Growth Hormone, and in 2001, he ran for Mayor of NYC as one of five Green Party candidates. He was editor of the national newspaper Green Politix, and of the NY State Green Party newspaper. Mitchel edited Red Balloon, the journal of the Red Balloon Collective that he cofounded at SUNY Stony Brook, and chaired WBAI radio’s Local Board. His writings include: The Social Construction of Neurosis, and numerous other pamphlets; What is Direct Action?, a book that draws on personal experiences as well as lessons from Occupy Wall Street; An American in Revolutionary Nicaragua; and two books of poetry, One-Eyed Cat Takes Flight and The Permanent Carnival.